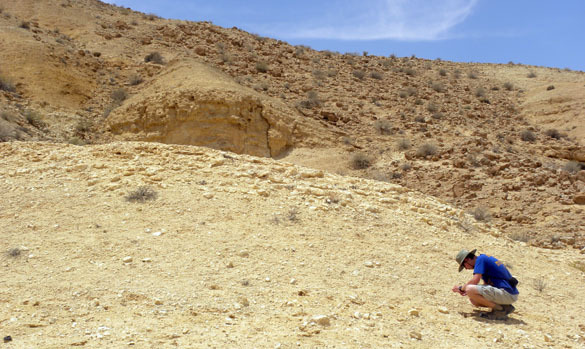 Will Cary collecting crinoid pieces at a site we creatively call "GPS 055". In the upper left you can see a triangular exposure of marl where Jeff Bowen did his Independent Study work in 2005. 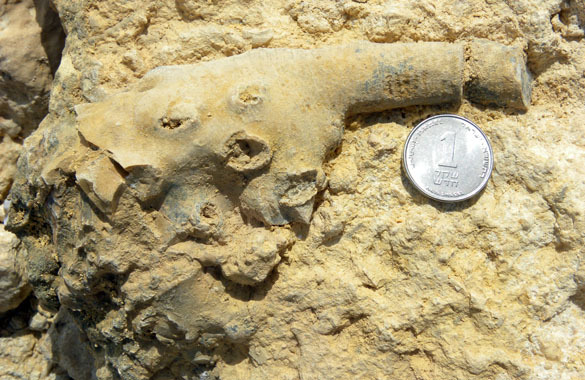 MITZPE RAMON, ISRAEL–One of our missions on this expedition to Israel is to find more and better examples of a distinctive crinoid in the Middle Jurassic Matmor Formation. Crinoids are stemmed echinoderms with a very long geological history, dating back to the Ordovician (or Cambrian, depending on who you believe). They are still alive today so we know much about their biology. They usually have long stems with a holdfast on one end (attaching it to the substrate) and a calyx on the other containing most of the body. The calyx has feathery arms attached at the top that filter the water to catch fine-grained organic particles and pass them down to a central mouth. 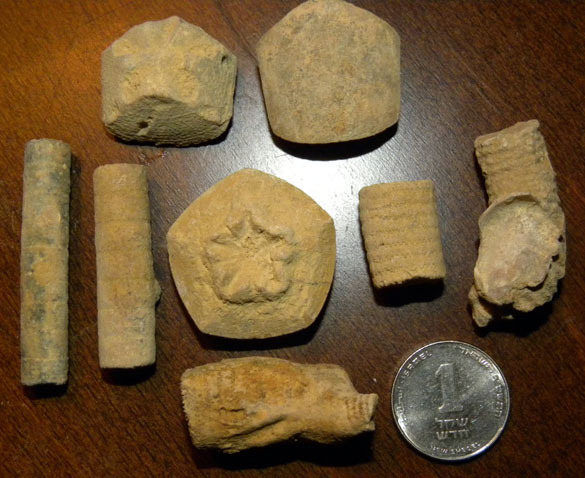 Parts of the Matmor Formation have abundant crinoid fragments, all belonging to at least two types of Apiocrinites (a crinoid genus). Two years ago I collected some beautiful specimens, but still lacked some critical pieces. Today Will and I revisited my earlier localities (thank you, GPS technology) and found beautiful specimens. Our prize is the holdfast pictured above. This is a mass of skeletal calcite the crinoid used to glue itself to the bottom of a coral. The shallow pits apparently represent additional “roots” it used to brace itself in a cavity under the coral. The stem then horizontally protrudes to the right so that the calyx and feeding arms could eventually reach the open seawater. I’ve never seen a holdfast this elaborate in the Jurassic. Above are typical other parts of this Jurassic crinoid (imaged with all my hotel room photographic skills). At the top are two calyx side pieces showing the interior (left) and exterior (right). The star-shaped object in the middle is the calyx base, seen from the inside. It is flanked by stem fragments, the one on the far right encrusted by an oyster. At the bottom is a crinoid stem with a branching holdfast of another crinoid attached to it. Mission accomplished as far as the crinoids go!